The vast 27 000ha desert paradise of red sand dunes and savannah woodland of Kalahari Game Lodge is home to 50 mammal species. Searching for the Kalahari Lions and Cheetahs during the game drives is a unique wildlife experience. Over 200 bird species can be spotted here. Summers are hot and dry and are great for early morning and evening game viewing. The hot midday is best spent relaxing by the pool. The winter days are sunny and warm, but the evenings can get cold. These are spent in front of a cosy fire. Rustic, comfortably furnished chalets, under shady camel thorn trees, combined with friendly hospitality will ensure a memorable stay. The Kalahari Desert is part of the huge sand basin, reaching from the Orange River up to Angola, over the east of Namibia, into Botswana and South Africa. The erosion of soft stone formations created the sand masses. The red parallel dunes with wind-shaped sand ridges were stabilised through vegetation and are so typical of the landscape in the Kalahari. Unlike the dunes of the Namib Desert, those of the Kalahari are stable and not wandering. Dominant vegetation: grasses, thorny shrubs and Acacia trees. In 2002 three Kalahari lions one male, N/oep – meaning “the boss” in the language of the San and 2 females N/hai – meaning “dark” and N/adi – meaning “the youngest” were relocated from the Kgalagadi Transfrontier Park in South Africa, to Kalahari Game Lodge. Their new home covers an area of 24000 ha on, which they roam free. An abundance of game ensures that they can hunt/ feed in their natural habitat. The lions are tracked by the radio signal from their collar-transmitter. The monitoring of their movements is essential to the project, which was devised for the benefit of the Kalahari Lion. Every stalk is crowned with success and visitors can watch these impressive animals in the wild – which is unparalleled in Namibia. Camp sites are located about 1 km from the lodge next to the dry Auob river bed, set spaciously apart from each other to offer more privacy. Each campsite has its own roof covered structure that includes a shower, toilet, washing up facility and barbeque area. No electricity is available at the campsites and each unit is equipped with solar lights and a solar geyser. A maximum of 4 persons per site is recommended. Rates are subject to change without prior notice should tax be increased or Government levies introduced. Rates include Value Added Tax. 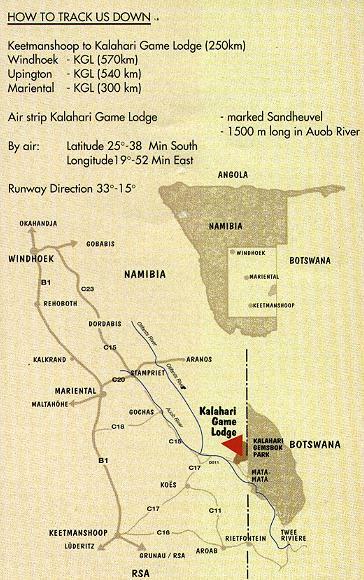 Transfers between landing strip and the camp (+- 8 km) are payable directly to the camp.